Applications for the 2019 USCS-SSRC DPD Program are due February 8, 2019. Alexandra Grundler’s background in dance and her appreciation for art led to her current course of doctoral research: morality and dance, and “symbolism as the connection between beauty and morality” in artistic expressions as diverse as sculpture, poetry, painting, and folk dance. 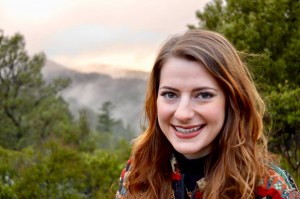 Grundler is a third-year PhD student in the Philosophy department at UC Santa Cruz, and a recipient of a 2018 UCSC-SSRC DPD Fellowship. Your research is on the moral dimension of dance. Can you tell us more about that—what are your academic and artistic interests, as well as your main intellectual concerns? 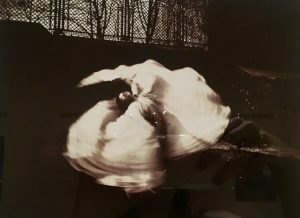 Photo by Alexandra Grundler: “Loïe Fuller dansant” by Harry C. Ellis, shown at a dance exhibition at Musée Rodin. One thing that makes dance uniquely fascinating to study philosophically is that the art is living and resides in the movements of a human being—it therefore necessarily involves ethical considerations because of this direct person-to-person confrontation. Dancing lives in time; that is, the richness of the artistic movement is as fleeting as the body dancing it. The medium does not result in any other lasting product—no book, no painting, no sculpture remains when the performance has concluded. Another interesting thing is that any notation left by the first choreographer is taken up, interpreted, and changed by the following choreographers and stagers. 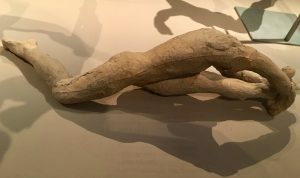 Because of this living, evolving nature of the art, the first-hand accounts that remain from original choreographies are even more fascinating to study and interpret. I am interested in how a dancer experiences this re-embodiment of a mythical character, one that is potentially centuries old and has been played by hundreds of dancers before her. That’s a start to my love of dance, though I am interested in everything from the subtle artistic dialogues that catalyze the evolution of dance technique to what it means to be a body and create art most generally. How did you use the UCSC-SSRC DPD grant in 2018? Did you find that your research path changed direction somehow? I spent two months studying in multiple locations throughout Europe. Many days were spent in archives at libraries and museums, but I also got a chance to meet with contemporary thinkers I admire as well as attend book talks, conferences, and lectures on everything from applied phenomenology at the Center for Subjectivity Research in Denmark to folk-dance ethnochoreology in Hungary. Alexandre Lacauchie’s image of Marie Taglioni. Photo by Alexandra Grundler, taken this summer at the Bibliothèque Historique de la Ville de Paris. Two directions I ended up pursuing stand out to me as particularly surprising. Firstly, I started off looking at dancers’ perspectives on their work, but became interested in other perspectives of dancers that speak to their embodiment of a mythic archetype. This can be seen in poetry, painting and sculpture from people like Hugo, Mallarmé, Degas, and Rodin, to name a few. One famous example of this is in Alexandre Lacauchie’s image of Marie Taglioni as a floating sylph [see image]. 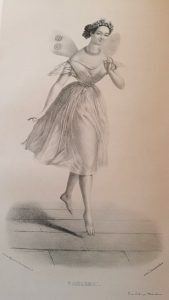 Another unexpected turn was a shift from studying only theatrical dance to looking at how non-theatrical dances such as folk-dance are relevantly different ways of using artistic expression in the body to ethically relate to one another. How have these new areas of inquiry—dancers’ embodiment of a mythic archetype, and non-theatrical dances—shifted your dissertation research overall? I was convinced by the account of F.W.J Schelling, the German Romantic Philosopher of the early 19th Century, that drama was to be considered the highest form of art because it is a complete unification of poesy, music, and dance. For Schelling, however, only ancient dramas live up to this potential because they possessed historically embedded mythological content and a symbolic form. I set out on my research to prove concretely that Romantic Ballet achieves Schelling’s dramatic ideal. Ballets like La Sylphide and Giselle answered the call to create new myth and captured their modern mythic content in a genuinely symbolic form (displaying the universal and the particular in a unified way). I followed this idea of how individual dancers relate to the universal archetypes they embody, and also how audience members conceived of these archetypes (interestingly, Mallarmé considers the ballerina to be a symbol as well). However, because of a new interest I had in the potential extension of this theory of symbolic portrayal and significance to non-theatrical cases, I turned to Immanuel Kant for an understanding of how symbolism might play out in our experience of beauty more generally. Kant gives an appealing framework for understanding not just how art can have a symbolic form, but how we can engage with objects of both artistic and natural beauty in a way that is symbolically significant. This idea is crucial in understanding the testimony that beauty plays a significant role in one’s understanding of her ethical life. You’re now a third-year PhD student at UC Santa Cruz. Can you tell us what you are researching these days? Currently, I am trying to build an explanatory framework that can incorporate case studies like the ones I collected this summer (and those I will continue to collect in the coming years) on the impact of embodied aesthetic experience on living a good life. I am pursuing the idea of symbolism as the connection between beauty and morality in expressions of art and in artistic experience. I am attracted to the Romantic idea that symbols allow us to unify our embodied experience of the tangible world to a universal, ethical ideal. Spending the last few years studying aesthetics, over a decade dancing, and a lifetime being interested in art have all influenced my path.